Versatility is sometimes critical when leading tour groups, directing activities on an athletic field, or in emergency response situations. Our PA219 delivers a wireless mic (with a wired mic input), an input to connect a smartphone, an SD card, and a USB port. 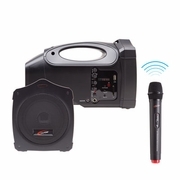 With a 750’ range, the PA219 broadcasts music or messages so the entire crowd can hear critical information.